We set up the basic project and installed the required dependencies. We added SocketIO to our project and added the server side logic for when a player connects and disconnects to our game. We wrapped up by adding the SocketIO library to the client side code. In Part 2 of this tutorial series, we will continue adding the web socket logic to client-side code, update the logic for adding players to our game and start adding the logic for allowing the players to attack. If you didn’t complete Part 1 and would like to continue from here, you can find the code for it here . Before we start working on the logic for creating our player when the currentPlayers web socket message is received, we are going to refactor the logic in the methodcreate of our Phaser game. Currently, our methodcreatecontains a lot of logic and to make our game more manageable,so we are going to split the logic out into a few different functions. In the code above, we moved all of the logic that was in the create function into separate functions, and we removed the collision logic for the object layer in our game. If you save your code changes, restart the server, and visit http://localhost:3000/game.html in your browser, you should see that the game still loads. If you move your character around the map, you should notice that the character can now walk through the trees. First, we removed the this.updateCamera(); line. We will be moving this to the createPlayer function. We then added event listeners for the currentPlayers and newPlayer web socket messages. In the function that is triggered when the currentPlayers event is received, we create an array of all the keys in the players object and loop through them. We then check to see if that object’s playerId matches the socket id of the currently connected player. If the id matches, then we call the createPlayer function and pass that function the player object. If the id does not match, then we call a new function called addOtherPlayers and pass that function the player object. In the function that is triggered when the newPlayer event is received, we call the addOtherPlayers function and pass that function the playerInfo object. First, we updated the x and y position of the player game object to be 0. Since we will be placing the player game object inside a container, that object’s location will be relative to the container’s location. Next, we created a new container and placed that container at the location of the playerInfo object that was created on the server. Then, we enabled physics on the container and added the player game object to the container. Finally, we called the updateCamera function and updated the setCollideWorldBound logic to be tied to the new container instead of the player game object. First, we added a check to see if the new container object existed. We did this to make sure we didn’t run any of our update logic until the container object has been created. Next, we updated all of the setVelocity lines to be tied to the container game object instead of the player game object. Now, if you save your code changes and refresh your browser you should see that the game still loads and that the player is now at a new location. If you refresh your browser, you should see that the player gets created at a new location each time. First, we created a new game object using the information contained in the playerInfo object. Then, we choose a random tint for the otherPlayer game object and stored that player’s id inside the otherPlayer object so we can reference that value later. Finally, we added the otherPlayer game object to the otherPlayers group. Now, if you save your code changes and refresh your browser, the game should load like before. However, if you open a new tab or window and navigate to the game page, you should see the other player in your game. Note: you may need to move your player around the map to find the other player. Before we move on to creating our enemies, we have one issue we need to resolve with our player creation logic. Currently, if a player keeps refreshing their browser, or if they exit our game that player’s game object will stay in the other player’s game. First, we listened for the disconnect event and we defined a function that will be triggered when this event is triggered. When this function is called, that function will receive the id of the player that disconnected. Inside this function, we create an array of all of the otherPlayer game objects by calling the getChildren method on the Phaser group. We then, use the forEach method to loop through the array. While looping through the array of game objects, we check to see if that game objects playerId matches the provided playerId, and if it does then we destroy that game object. Now, if you save your code changes, refresh your browser, and load the game in multiple tabs, you should see that the individual player game objects are removed when they leave the game. With the player creation logic out of the way, we will now start working on creating the enemies in our game. For this tutorial series, we will be creating the enemies on the client side of our game. Normally, we would want to create these enemies on our server and broadcast their location to the client side, however, this is out of scope for this tutorial. First, we changed the class type of the game object that was being created from Zone to Sprite. Next, we changed the number of enemies created from 30 to 20. Then, when we are creating the enemy game objects we call a new function called getValidLocation to get the location for where to place the enemy game object. 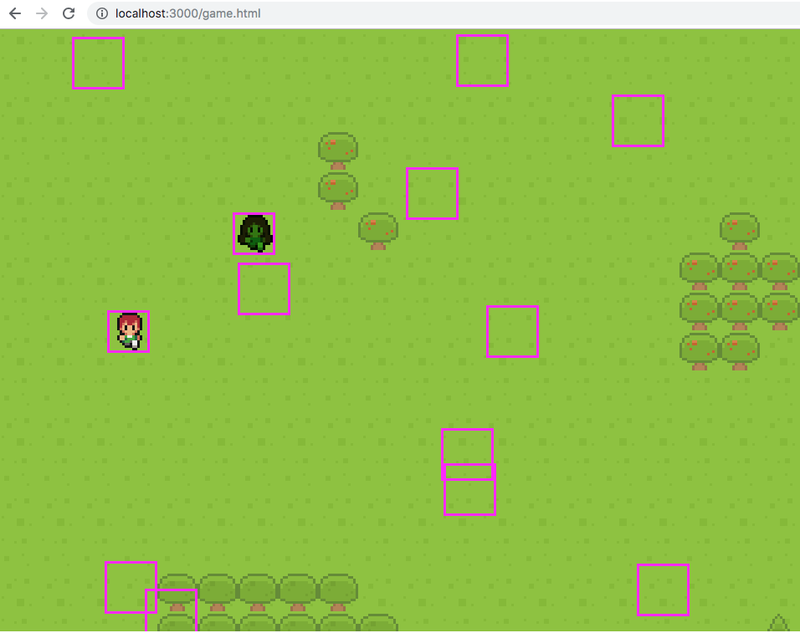 Then, when we create the enemy game object we pass the location we just created and we use a new function called getEnemySprite to get the sprite for this enemy game object. Finally, we call the setCollideWorldBounds and setImmovable methods on the enemy game object’s body. 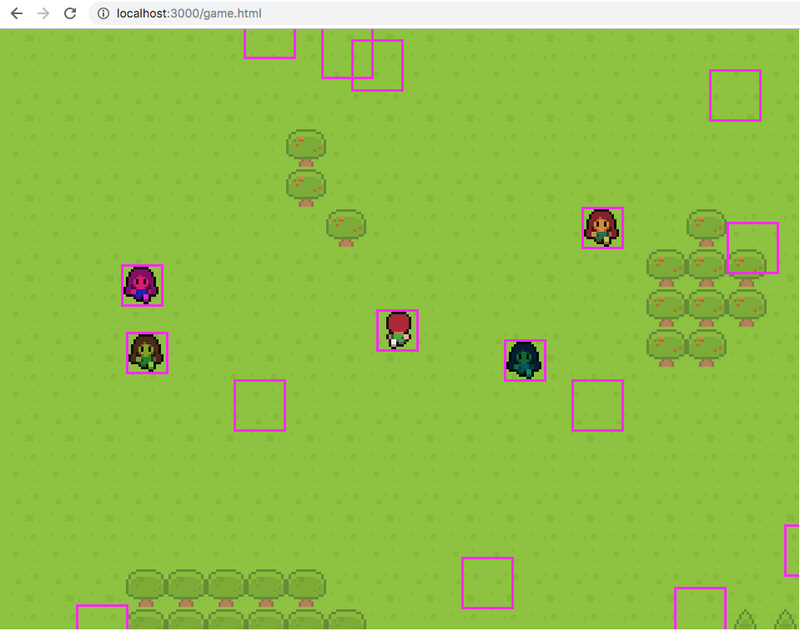 First, in the getEnemySprite function we created an array of the enemy sprites we loaded earlier. Then, we used Math.floor and Math.random to return a random sprite from that array. Then, in the getValidLocation function we create a while loop and inside the while loop, we generate a random x and y position that is within the bounds of our game. Once we do this, we loop through all of the enemy game objects. For each of the enemy game objects, we get the bounds of that game object and we check to see if the x and y positions we created earlier are contained within those bounds. If the x and y positions are not occupied, then we exit out of the while loop and return those positions. Now, if you save your code changes and refresh your browser, you should see the new enemy game objects. Add logic for moving the enemy game objects. Add logic for attacking the enemy game objects. Add logic for allowing the players to chat.